When wiggles are sprouting and “end of the year” emotions are blooming, I find that using interactive activities helps keep us focused in the music room. I’ve collected lot’s of manipulatives over the years, and didn’t have much that was specifically for spring. I wanted something that K-3 could use in different activities in each grade. Flash cards are perfect manipulatives to use across grade levels. I can then tailor each music lesson and activity to fit the learning goals of each grade. These kinds of activities also pair well with a movement activity either before or after working with the flash cards. So that’s why I decided it’s time for a Spring Beat and Rhythm Music Freebie! WHY SPRING BEAT AND RHYTHM ACTIVITIES? The following games and activities are meant to provide opportunities for students to practice saying and playing rhythms and/or assessment and pre-composing. These activities work well with Kodaly, Orff and MLT methodologies. Students will have opportunities to create and play patterns, create and play melodic phrases and demonstrate rhythms. You may choose to have your students sing or “play” their “songs” as part of your assessment activity. The games and activities are very adaptable to different grade levels. For example: use the activities in whole class for Kinder, First and Second Graders and use them in Centers or Stations in your upper elementary music classes. When I make my lesson plans I focus on 3 main things. 6 Activity Ideas to use in whole class or Center activities. Rhythm Cards are in Color with and without words and rhythms, and in Black and white with and without words & rhythms. Want to download this freebie? All you need to do is SUBSCRIBE TO THE SING PLAY CREATE RESOURCE LIBRARY HERE. #6 Color and Create using color coded melodies and instruments. Use the patterns as an ostinato part in a song or as part of your lesson. Combine one of the games as part of a lesson. I like to pair rhythm activities with creative movement. Since it’s spring time, it’s true- the bunnies are out hopping everywhere. . . What I mean is that the kids need to MOVE! My students love this song! “Shake Your Egg!” They play along with color coded egg shakers. Another Game that my students like to play is “Where’s the Easter Egg?” It’s a game to show Dynamics. Perfect for Easter time. It’s available in the TpT store. You can get some Egg Shaker teaching ideas from this blog post. Check out the wide selection of Youtube music videos you can use in your lessons. Spring music class can be an especially fun time during the school year. Students have had time to develop their music skills and now are ready to show them off! 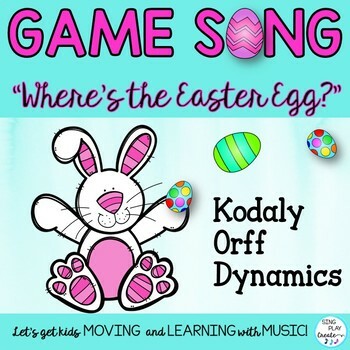 Give the Spring Beat and Rhythm Music Freebie a try in your classroom and share how your students used the activities and played the games. Like this post? Please share with your teacher friends. Halloween Songs and a Freebie!